Brooklin Models 1965 Chevrolet Impala 2-Door Hard Top. 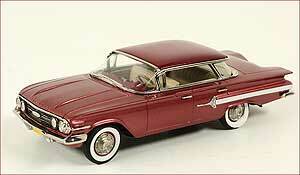 Brooklin Models 1960 Chevrolet Impala four door hardtop Sport Sedan. This extra detail model is finished in Sateen Silver and Ermine white. 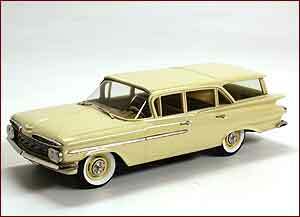 Brooklin Models 1959 Chevrolet Brookwood 4 Door Station Wagon, finished in classic cream. Among the extensive line-up for Chevrolet in 1959 were four wagon series. At the top was the Nomad, supported in descending order by the Kingswood, Parkwood and Brookwood. The entry level Brookwood, which was the wagon equivalent to the Biscayne sedan started at just over $2,500 for a two door with the four door selling for a little more. 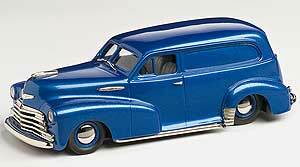 Available with 6 or V8 power, these large handsome wagons proved popular with the buying public. Brooklin Anniversary Model to celebrate 40 years of Brooklin Models. This is the first of four anniversary models. Chevrolet Impala, presented in a special presentation box. 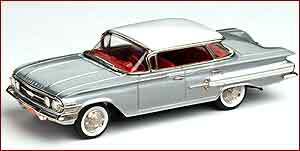 Brooklin Models 1960 Chevrolet Impala 4-Dr H.T. Sport Sedan. In 1959 General Motors overhauled its entire line-up from Chevrolet to Cadillac, allegedly as a result of a GM executive spotting Chryslers new models in a compound a year previously. All new, all over again had been Chevrolets slogan for 1959. For 1960 things were toned down rather although the basic options remained largely the same. The flat top styling of the four door sport sedan, was carried over, although sales figures were a third of the regular sedan. The flat top is a much prized collectible today. 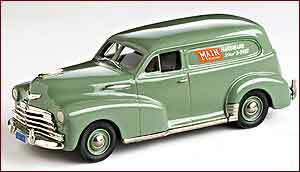 Brooklin Models 1947 Chevrolet Stylemaster sedan delivery. 1:43rd Scale model hand built in England, in heavy white metal. The 1947 Chevrolet line-up marked the penultimate year of a design that really started in 1940. Over the ensuing years either side of the Second World War, each year saw detail modifications both mechanical and in styling.Offered in two door coupe, two and four door sedans, two door Aerosedan, convertible, station wagon and sedan delivery versions, the range offered something for everyone.The Sedan Delivery was very popular with small businesses and most were driven into the ground making this model very rare today.